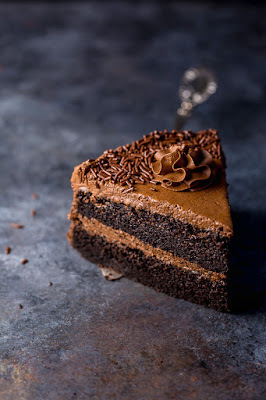 This Super Decadent Chocolate Cake with Chocolate Fudge Frosting is the ONLY chocolate cake recipe you'll ever need! Preheat oven to 350°(F). Generously spray two 9-inch round baking pans with non-stick baking spray and set them aside. 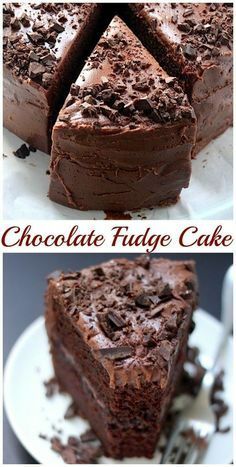 In the bowl of a stand mixer fitted with the paddle attachment, or in a large bowl using an electric mixer, combine both sugars, flour, cocoa, baking soda, baking powder and salt on low until ingredients are thoroughly combined. Set aside. In a separate large mixing bowl, whisk together the eggs, yolk, sour cream, milk, oil and vanilla, beating until well combined. Add the wet ingredients into the dry ingredients and beat on low speed until just incorporated. Carefully add in hot coffee (or water) and continue beating until completely combined; about 1 minute. The batter will quite thin. Bake in preheated oven for 30 to 35 minutes, or until wooden toothpick or cake tester inserted in the center of a cake comes out clean or with just a few moist crumbs attached. Cool cakes for 10 minutes in the pan (placed on top of a cooling rack) before removing from pans and transferring to a cooling rack to cool completely. Place the chocolate in a medium heatproof bowl and place it over a pot of barely simmering water. Heat, stirring frequently, until the chocolate is completely melted. Remove the pan from heat, then carefully remove the bowl from the pot. Set chocolate aside to cool for a few minutes. In the bowl of a stand mixer fitted with the paddle attachment, or in a large bowl using a handheld electric mixer, beat the butter on medium speed until creamy. Reduce the speed to low and gradually add the confectioner's sugar, one cup at a time, beating well after each addition. Once all of the sugar has been added increase the speed to medium-high and beat for 2 minutes, scraping down the sides of the bowl as needed. Beat in the vanilla and melted chocolate and continue beating until well combined and creamy. Using a long serrated knife, level the top of each cake. Transfer one layer to a large plate or cake stand. Using a long offset spatula, spread a thick layer of frosting on top, then top with the second layer. Continue frosting the top and sides of the cake. Decorate with chocolate chips, sprinkles, chocolate shavings, or leave as is! 0 Response to "Super Decadent Chocolate Cake with Chocolate Fudge Frosting"